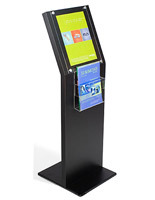 Free-standing signs are a common sight in public areas, but that doesn't mean they have to look common. 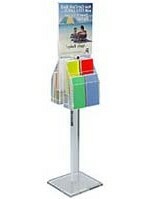 Any one of these 11 x 14 poster floor stand models offers high style suitable for any interior environment. 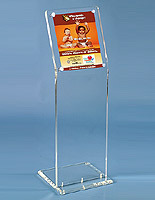 Featuring pedestal designs with or without literature holders, the sign displays do a great job of informing or directing. 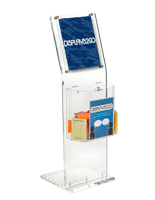 Our floor stands accommodate 11 x 14 posters or signage, supplied by you. 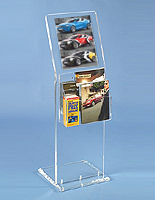 Thanks to their free-standing design, they can be placed just about anywhere. 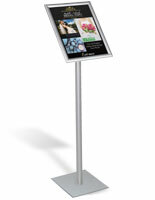 Use at lobby entrances to direct visitors, or inside a storefront to advertise and promote your business. 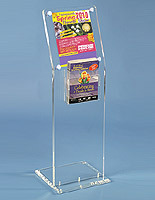 These 11 x 14 poster floor stands also are available in a wide range of prices suitable for any budget. Oftentimes, these signs are the first thing people notice upon entering your establishment. Don't opt for the cheap alternative — buy a professional-quality display everyone will be impressed with! For the most part, these stands feature contemporary styling. 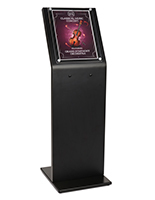 Minimal pedestals rise up to display signage slanted at the perfect viewing angle. 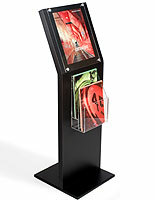 Wooden models are skinned with durable black plastic laminate. Comparable styles also come in the same design, yet manufactured with thick, crystal clear acrylic. We machine-polish all edges for a beautiful presentation — one that gets noticed! Your custom signage is inserted behind 1/4" acrylic faceplates. This keeps the graphics perfectly flat and protected. Decorative metal screw caps provide the finishing touch to these handsome sign displays. 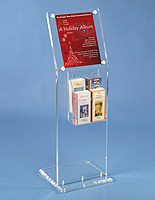 Purchase the sign stand "as is" or buy one with your choice of literature holders. 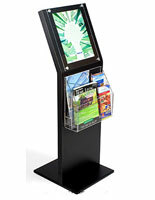 These store standard folded brochures or full size catalogs and magazines. They make great "go withs" to the poster display! Advertise a sale, merchandise, or service while offering takeaway literature the customer can leave with. 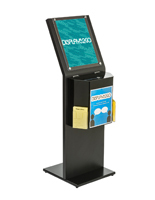 In addition to the retail side of applications, the hospitality industry uses these for welcoming patrons with messages and/or wayfinding. 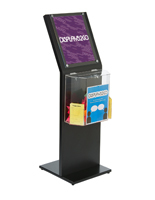 Place in front of hotel check-in counters to direct clients to the right desk. Or, display your restaurant's menu outside the entrance to entice passersby. 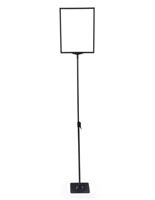 The use of quality materials and modern design sensibility makes these display stands excellent choices for upscale environments!